See What You Receive As A Member! Our goal as a Chamber is to provide opportunities for our members to grow by creating an environment for them to be more successful. The only way to help ensure that this happens is for our members to take advantage of and become involved in the offerings, programs and activities that the Chamber makes available & are already included in your membership. 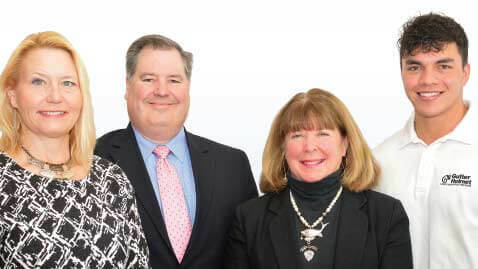 As a member you have the ability to reach our very broad network of businesses, community partners and the general consumer market through targeted events and programs to consumers throughout WNY. Claim your member listing on the Chamber website – www.eanycc.com – and by creating your own “mini-website” on our site, you increase your business’ visibility and Search Engine Optimization! Business Referrals are an important part of what we do in answering 6,000 requests for information annually through phone calls, emails, regular post office mail and visitors who walk through the door. We only refer members. Great networking opportunities through our networking group and through our many other events, programs & meetings. We share your social media postings on Facebook to help spread the word about your business. Like us on FB. Submit a business profile/bio or other interesting information on your business i.e. special sales or promotions, special event, employee highlight, etc. in our newsletter that goes out twice a month. There is no limit to the number of submissions you can make in reaching our 500 member business network. Thousands of visitors walk through our doors annually. Display your business information/business cards at the Chamber’s visitor’s center at no cost. There is an opportunity to be a featured business on our information display center through Profile Display. There is a cost for this service. Your business listing in our membership directory/consumer guide reaching over 6,000 potential customers in addition to your business listing on the Chamber’s website for access to your information 24/7 with the potential to reach thousands more customers. Business display ads are also available on our website & app. Become a sponsor for one or more of our featured events. Meet with us and let’s see what event best fits your goals. Participating in our gift certificate program ensures $20,000+ worth of gift certificate purchases annually are spent locally with our Chamber members. You should be one of them. If you’re a new business or considering a “re-grand opening” we can help you set up your ribbon cutting event and even provide the large scissors. On Tuesday, April 24th the Greater East Aurora Chamber of Commerce will be recognizing 40 high school seniors at its 21st Annual Chamber’s Choice Awards at the Holland Willows Restaurant. The event is coordinated by the Chamber’s Business Education Alliance comprised of educators and business representatives working to strengthen the partnership between our schools and businesses. The key note speaker for the evening will be Melissa Lauricella, Human Resources Supervisor for Astronics, Inc.
Special thanks to Tops Markets as Head of the Class sponsor and the other additional 39 supporting businesses coming together to recognize these 40 students. The event is open to the public. Dinner tickets are $20.00 per person. For further information and reservations contact the Chamber office at 652-8444. 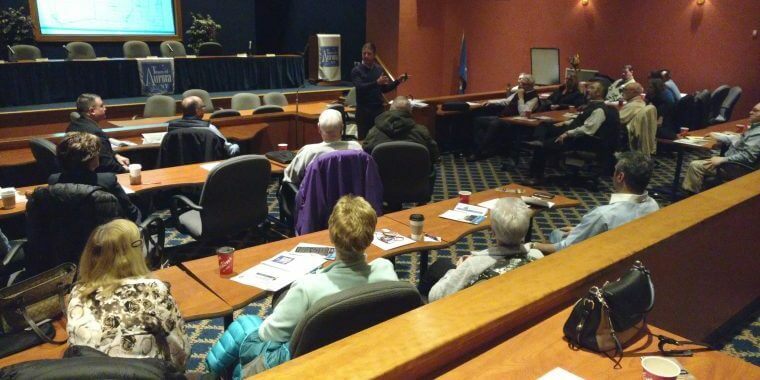 SCORE Seminar Prepares Business Owners! SCORE Seminar Introduces Potential Business Owners to Preparing for Starting & Managing Their Own Business! Starting a business is a very difficult thing to do! Since the Greater East Aurora Chamber partnered with SCORE and the Southside Commerce Center in opening a SCORE office in the Village of East Aurora in January, things have been moving forward very well in an effort to help people thinking of opening a business make the transition successfully. SCORE mentors have been meeting on a fairly regular basis with people interested in opening businesses and with current business owners who may be facing a challenge in their business. This past Saturday, March 24th, SCORE offered an all-day seminar to 40 potential business owners which covered topics such as business plan development, determining your market, developing a marketing plan and how to conduct market research. In addition, business law, finances & taxes, and business insurance were discussed providing attendees with a very thorough overview of factors to consider when starting a business. The SCORE mentorship team works to help these entrepreneurs to start off on the right foot! All services are free. Regular office hours for SCORE mentors are Tuesday & Thursday from 4 – 7pm or by appointment at the 300 Gleed Ave. office. Check out www.BuffaloNiagaraScore.org for additional information. Small Business Summit Provides Great Opportunities for Local Businesses! 35 business people attended this morning’s (Thursday, March 8) Greater East Aurora Chamber of Commerce’s Small Business Summit with NYS Senator Patrick Gallivan & business consultant Frank Swiatek. Senator Gallivan discussed a variety of challenges NYS is facing that impact businesses including increased taxes and over regulation that make it more difficult for businesses to operate. He also discussed the disparity in representation of elected officials in Upstate New York versus Downstate and the negative impact it has on being able to address issues for upstate businesses and residents. Frank Swiatek presented an overview on “How to Grow Your Sales in 2018 with Six Sigma Thinking”. The presentation focused on basing business decisions on metrics and specific measureable components and that sales performance, regardless of the type of business or industry, is determined by mindset, behavior and skills and that sales results occur, good or bad, because a process is in place producing them. The more “defects” or “breakdowns” you have in the process, the poorer the results. Attendees also had the opportunity to meet one on one with Senator Gallivan and Mr. Swiatek to discuss issues specific to their business. 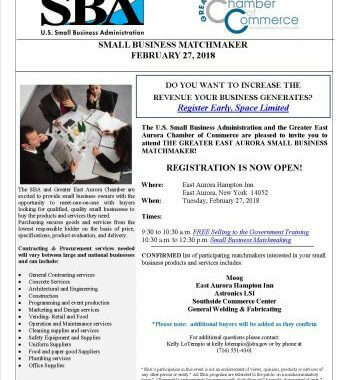 The Greater East Aurora Chamber and the SBA will be holding their business Match Maker event Tuesday (2/27) AM at the East Aurora Hampton Inn pairing businesses looking to purchase services and products with businesses who can fill those vendor needs. Over 70 “sellers” will have 3 minute appointments with 1 or all 5 of the participating buyers. Contracting and procurement services needed vary and can include – general contracting services, architectural & engineering, construction, marketing and design services, cleaning supplies and services, uniform suppliers, office supplies and more. This is just one of the many programs and opportunities that the Chamber works to offer its members in helping them to grow their business. The Chamber has had information out for several weeks regarding the publication of our 2018 Membership Directory/Consumer Guide. 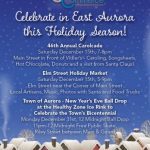 This is a great opportunity to get your business’ name out in front of 6,000 consumers throughout the Greater East Aurora and WNY communities! We want to make sure that any business that wants to be included will be! Members just need to make sure their membership is current and that you have completed a membership information update form and have submitted it to the Chamber to insure all your business information is correct. If you’re not a member we invite you to join today to be part of this widely distributed publication and take advantage of all the other benefits members receive. Our deadline for receiving this information is Friday, January 26th. Please feel free to contact the Chamber office at 652-8444 or eanycc@verizon.net with questions or for membership information. Last Tuesday SCORE opened its East Aurora office at the Southside Commerce Center at 300 Gleed Avenue in the village. 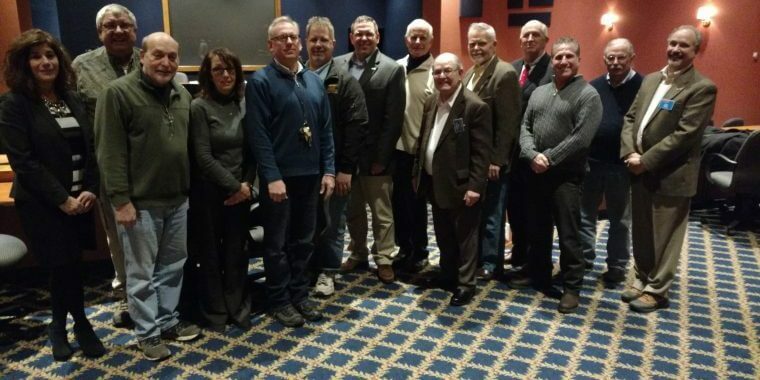 Present at the opening were representatives from the Buffalo Chapter of SCORE, the Greater East Aurora Chamber of Commerce, the Southside Commerce Center, local business men and women and community members. SCORE’s mission is to foster vibrant, small business communities through mentoring and education. Experienced mentors are available to meet to assist with a variety of business topics i.e. sales, marketing, business plan development, etc. in a variety of industries. The Chamber housed a SCORE counseling site at its former office on the Roycroft Campus but in moving to its current Main St. site did not have sufficient space for SCORE. In recent discussions with SCORE the Chamber and SCORE were able to partner with Jim Cornell at the Southside Commerce Center to provide space for SCORE to meet with clients to discuss their business issues. Mentoring opportunities began January 18. 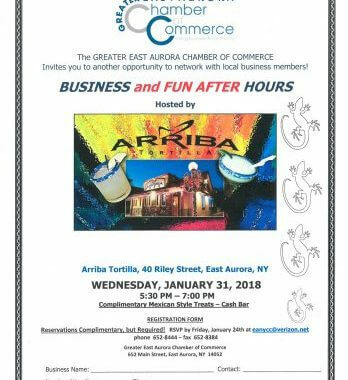 To schedule a free mentoring session or join SCORE’s volunteer team, visit SCORE’s website at www.buffaloniagara.score.org or contact the Chamber office at 652-8444.
Business After Hours at Arriba Tortilla! This Is What We’ve Been Talking About! When I talk to members, potential members and people in the community about what the Chamber is doing and what our focus is I talk about events, business development, tourism marketing and promotion and workforce development. The first 3 are pretty straight forward and easy to understand but when it comes to workforce development people don’t seem to get it. They may understand that it’s hard for businesses to find the right people with the right skills but they don’t always get the connection and the roles our local schools play in the equation. There is a very good article in the recent issue of the Arcade Herald by Julia Ferrini that talks about Wyoming County’s Emergency Medical Dispatchers and how the county is working to hire additional dispatchers. County Sheriff Greg Rudolph says that while Dispatch isn’t short staffed, there are currently 8 full-time and 4 part-time employees, there is still room for 4 more part-time positions. Rudolph says that one of the best qualities a potential candidate for the position can possess is the ability to multitask and communicate with people (key to any workplace environment). “That is one of the problems we face,” Rudolph said. “We have a younger generation that can run the computers, but are lacking in communication skills. We have an older generation that have the communication skills, but are lacking in computer skills”. As a Chamber of Commerce we have for years and will continue to advocate for our schools (high school and college) to work to prepare our students for the needs of the workplace with both soft skills (communication, the ability to work with others) and the hard skills (technological and trade). This Wyoming County example is just a snapshot of what our communities will be facing in the future. Opening Doors to Create New Sales & Greater Cost Efficiency! On Tuesday, February 27th, at the East Aurora Hampton Inn, the Greater East Aurora Chamber of Commerce and the SBA will be providing an opportunity for small business owners to meet-one-on-one with buyers looking for qualified, quality small businesses to purchase products and services they need for their operations. Goods & services would be purchased from the lowest, responsible bidder on the basis of price, specifications, product evaluation and delivery. “Sellers” of products and services would have an opportunity to meet for brief appointments with “buyers” they might not normally be able to reach. Buyers would be looking for, but not limited to, general contracting services, architectural and engineering services, programming and event productions, catering, cleaning supplies, uniform suppliers, office supplies, etc. Sellers can be creative in how they approach buyers and how their services might benefit the buyers business. Prior to the 10:30 am to 12:30 pm Match Maker event there will be a “Selling to the Government Training Seminar” from 9:30 am to 10:30 am. There is no fee to participate in either event! Current buyers at this time include: Moog, East Aurora Hampton Inn, Astronics/LSI, Southside Commerce Center & General Welding & Fabricating. Additional buyers will be added as they are confirmed. To register or for further information or questions contact kelly.lotempio@sba.gov or the Greater East Aurora Chamber of Commerce gdgrote@verizon.net.